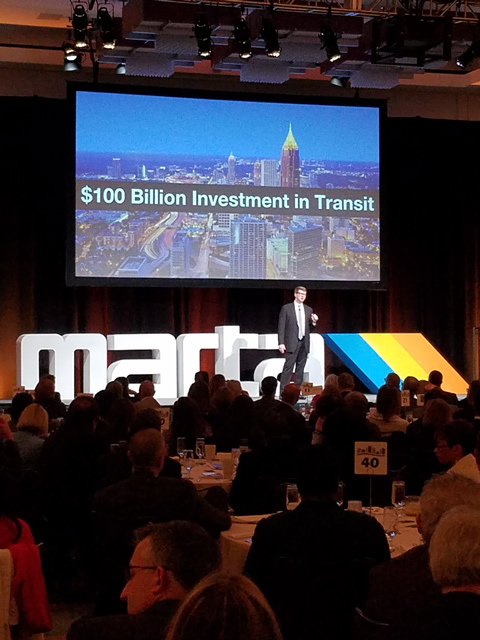 ATLANTA – Metropolitan Atlanta Rapid Transit Authority (MARTA) General Manager and CEO Jeffrey Parker today shared a bold vision for transit at the 6thAnnual State of MARTA Breakfast before a sold-out crowd of community, business, and civic leaders. 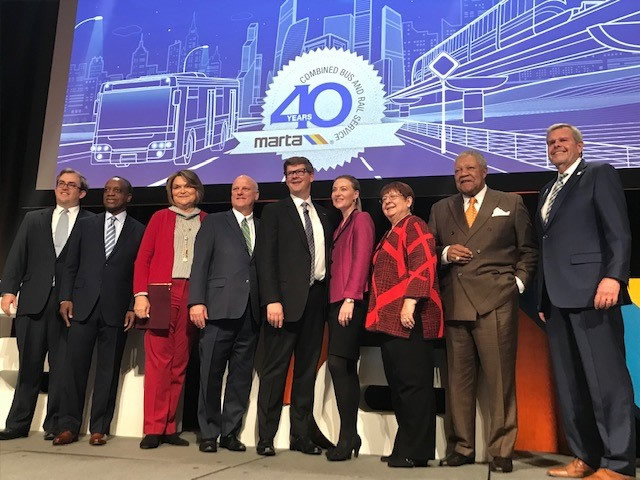 During the event, which heralds the transit agency’s four decades of combined bus and rail service, Parker declared the state of MARTA is healthy, financially stable and ready for expansion. Recognizing that service drives ridership, he promised a renewed commitment to world-class customer service and expanding MARTA as a catalyst for economic growth, innovative approaches to mobility, and community revitalization. In Parker’s first State of MARTA address, he challenged the crowd to rally behind a $100 billion investment in transit and technology over the next 40 years, rivaling the long-term capital plans unfolding in peer cities such as Los Angeles, Seattle, and Washington, D.C.
Parker said we need a “moonshot for transit,” to ensure metro Atlanta’s growth as a world-class region. Establishing a new Rider Advisory Council to provide customers with a formal voice to make meaningful improvements to the transit system. Hiring a Chief Customer Experience Officer that represents the customer internally and influences what we do and how we do it. Launching a multi-year initiative to enhance and overhaul all 38 MARTA stations through a comprehensive renovation and enhancement program. Ensuring innovative and integrated transit-oriented development at stations that support jurisdictional priorities around economic development, workforce housing, community engagement. Implementing a comprehensive training strategy for frontline employees and management to improve customer service. Recently appointed MARTA Board Chair Freda Hardage also reflected on MARTA’s years of service and the need for continued regional collaboration among metro Atlanta’s leaders to keep the nation’s ninth largest transit system on track. The event was co-hosted by the Council for Quality Growth, a not-for-profit trade association that works to ensure the metro Atlanta region’s regulatory environment supports quality growth and development.